In Part 1 and Part 2 of this blog series on community management, my tips centered on fresh content, visual content, user generated content and blog series. Given that you're reading a blog series (and I thank you for that), you'll see that I like to practice what I preach. As a community manager, you hope to have an active community. This is a worthy goal, but it can be challenging. While your site may quickly gain interesting and relevant content, this activity may occur during slow times on the site, and you need to make your users aware that this content exists . For this reason, we frequently market our content in various social media channels at different times and even multiple times. We vary our messaging in the hopes of drawing attention to interesting content on our site. "Marketing our content via various social media avenues is similar to fishing in different ponds or lakes." Our members engage in these social networks (e.g. Facebook, Twitter) and marketing our content there has proven to drive traffic and engagement to the content on our site. Some of our members simply can’t connect during the day and they may miss an update while they’re offline, so we also share in the evening when we know they’re checking their social media channels. Here's an analogy any outdoor enthusiast would love: marketing our content via various social media avenues is similar to fishing in different ponds or lakes. We throw our lures (content) out a few different times because we never know which fish are paying attention at any given time. When possible, we’ll “at mention” a user on Twitter or tag them on Facebook. Keeping up with all of these different social networks can be a little challenging, so we use a few helpful tools. For Twitter, I am a fan of TweetDeck as it lets me schedule posts throughout the day and monitor multiple accounts. I use it to efficiently manage engagement with our community members on Twitter. Another community manager manages our Facebook account . We coordinate the promotion of content on the site and he has conversations and interactions on Facebook that can be much different from the conversations I have on Twitter. Different voices, perspectives and conversations keep things fresh and updated. All in all, try re-sharing the same content at different times and see if it provides good benefits to your community member engagement. It definitely does for us. Pictured: This weather alert tool has been popular with the community. Everybody loves when you can help them do something more easily . If you can simplify a process or help them solve a challenge, your users will have even more reasons to return to your site. We’ve found that providing useful resources right beside the community content increases engagement among our users. Some of the resources I’ve provided to our outdoor enthusiasts include geo-locating weather and moon services, a “rut-tracker” (an app that allows users to denote deer activity and movement) and pages where taxidermists, processors and hunting clubs can post information about their services for free. These resources help hunters make decisions, find information, or simplify a process. One of the things I always try to do is communicate any changes in the community. Whether we’re getting a new blogger on board, getting a new sponsor or adding a new feature, I let my community know about it. After I let the community know about any changes, I’ll re-promote the updates weeks and even months later , in case anyone missed it. We recently went through a major site upgrade. This was a definite “jolt” to members. As you would imagine, change is not always met with a warm welcome, so I took some steps to help make the transition a little smoother for my community members. When we deployed the upgrade, I wrote an in-depth blog post about the changes and made a video walk-through of each new function. I also included a link to a “How To” video across the site. This kind of communication goes a long way in helping users transition to the new features and makes the change exciting, rather than frustrating. Communicating change achieves a couple of goals for me as a community manager. First and foremost, it shows transparency with members. When changes occur, my community members know that I will make them aware and over time it builds confidence in me as a community manager, and makes the users feel involved in and knowledgeable about the site . Communicating change also helps ensure lower user frustration. There is no one right way to manage a community. It’s not easy. Community management requires constant attention and focus. It’s not a set-in-stone set of rules. It’s constant tweaking, monitoring and adjusting. There is no Holy Grail. You have to be attentive, so that you can adapt and respond to your community’s needs. For a community to have success you must be constantly engaged and not afraid to initiate change. If you try to follow a straight path of community management, you will fail. And worse, you’ll fail to challenge yourself along the way. Instead, have some fun, try some strategies and see what happens. Be transparent along the way and you will learn what your community likes and doesn’t like. Keep in mind that the moments when you get nervous to try something new are the very same moments that you are becoming a better community manager . You will learn more about your community. That knowledge is the very thing that you need to be successful as a community manager. Every community is different and requires attention in unique ways. The principles I’ve outlined in this blog series might not all directly apply to your community, but I know some of them will. Managing a community is not an easy task and requires constant focus. I hope these tips provide you with some useful and applicable concepts. For related tips, read Part 1 and Part 2 of this blog series on community management tips. Getting started with an online community? 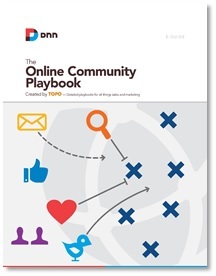 Read our Online Community Playbook. Then, get the party started.